A Cornucopia Of Linked Sources Proving Trump's Assertions About Crooked Hillary! When never-Trumpers and Trump supporters line up on the same side over a Donald Trump speech, it is worth digging into it to see how he managed to unite the two sides..... one word describes it all. 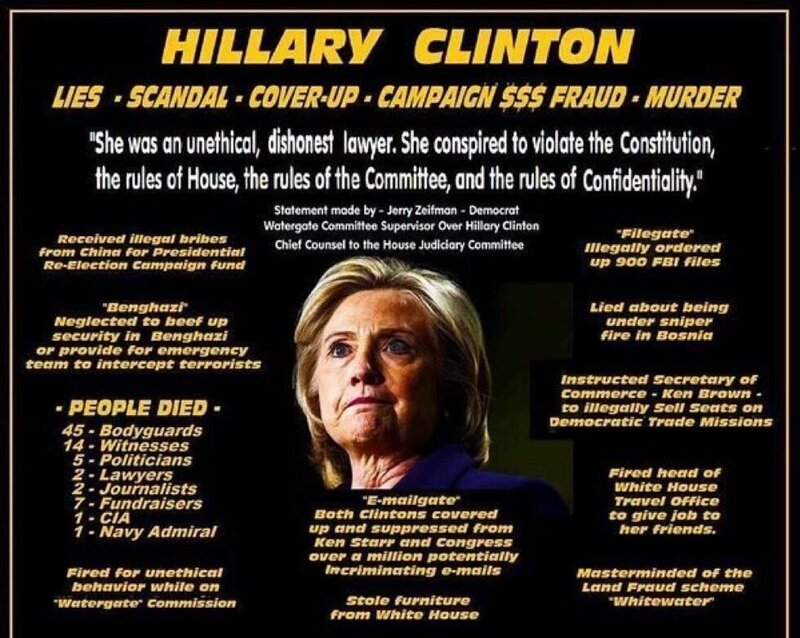 Love him or hate him, conservatives agree on one thing, Hillary Clinton is dangerous, has been caught in multiple lies, is going through a scandal that would have and has ended the career of others, and has gained a fortune selling out the middle class. Trump nailed her on each of these points and more. Anti-Trumper Mark Levin, who once told his radio listeners to consider him a "never-Trump" Republican, not only praises Trump for his speech, he declared that Trump "hit it out of the park," and that Trump's points were politically savvy and superb, according to WND. "The Republican leadership in Congress doesn’t have the guts to go to the floor of the Senate or the floor of the House and make these charges," Levin said, speaking of how Trump railed against Clinton and spoke in specifics about her acts of dishonesty and political deceptions, Breitbart reported. "This is outstanding. You can’t let Hillary Clinton get away with her corruption, her cronyism, her criminality. I don’t care who you support or don’t support. She’s detestable." Rush Limbaugh called the speech a "home run," stating "Well, I have to tell you, my email is overflowing with people calling Trump's speech a home run. People are saying, "Finally! It's about time somebody started telling the truth about Hillary Clinton, and it's not you. Finally somebody that's an official Republican starts telling us what we already know!" People are jazzed by this, according to my email and other feedback that I'm getting. We've got all the audio sound bites coming. Of course, I, as a powerful, influential member of the media, had a transcript of the speech before it was given." 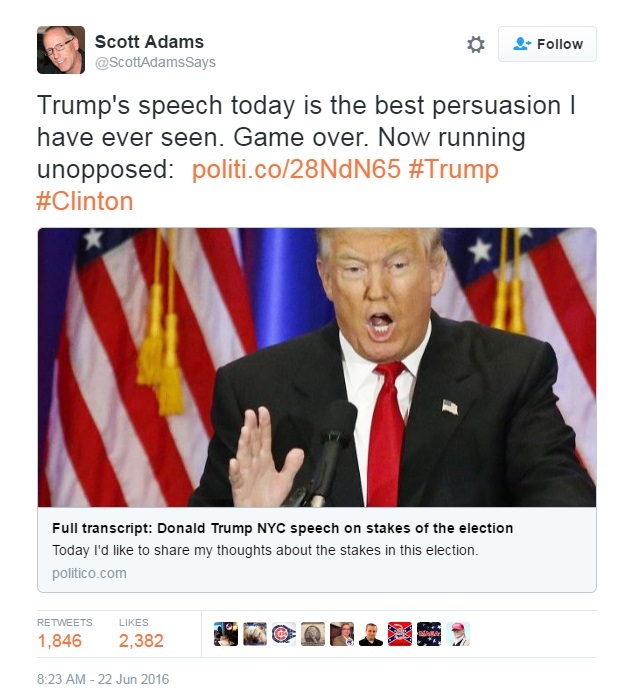 Below - From the 6/22/16 edition of "The Rush Limbaugh Show"
Acclaimed left wing author, creator and co-founder of Dilbert, tweeted "Trump's speech today is the best persuasion I have ever seen. Game over. Now running unopposed." It is only fair to point out that Adams has predicted a Trump win "by a landslide," but officially endorsed Hillary Clinton for the sole reason of "Clinton supporters have convinced me – and here I am being 100% serious – that my safety is at risk if I am seen as supportive of Trump. So I’m taking the safe way out and endorsing Hillary Clinton for president." The Trump anti-Hillary speech transcript can be read at Politico or Time, whichever readers prefer and the entire speech will be embedded at the bottom of this article. Skipping the portions where trump explained why he felt he could best address the dangers that face America, from economy to trade, we will provide links certain references Trump made about Hillary since in a speech one cannot offer the proof by way of links and previous headlines. TRUMP: … or her phony landing in Bosnia, where she said she was under attack, and the attack turned out to be young girls handing her flowers, a total and — look, this was — this was one of the beauts, a total and self-serving lie. Brian Williams’ career was destroyed for saying less, remember that. USA Today and Washington Post, multiple times, has busted the "world-class liar" Hillary Clinton on the emails scandal and her lies, misrepresentations and completely dishonest spin. The Bosnia reference stems from a claim Hillary Clinton made in 2008 in a speech at George Washington University, where she stated "I remember landing under sniper fire. There was supposed to be some kind of a greeting ceremony at the airport, but instead we just ran with our heads down to get into the vehicles to get to our base." Washinton Post's fact checker have Clinton Four Pinocchios for her tale, with video of the event showing her story was a complete fabrication. Clinton’s tale of landing at Tuzla airport “under sniper fire” and then running for cover is simply not credible. Photographs and video of the arrival ceremony, combined with contemporaneous news reports, tell a very different story. Four Pinocchios. CBS News was with Clinton on that trip and published the actual footage of what really happened. Trump also spoke about Clinton's making money for special interests, and the controversial hidden "speeches" to Wall Street and others to which $153 million in speaking fees had been documented for Bill and Hillary. TRUMP - The other candidate in this race has spent her entire life making money for special interests, and I will tell you, she’s made plenty of money for them and she’s been taking plenty of money out for herself. Hillary Clinton has perfected the politics of personal profit and even theft. She ran the State Department like her own personal hedge fund, doing favors for oppressive regimes, and many others and really many, many others in exchange for cash. Pure and simple, folks. Pure and simple. (APPLAUSE) Then when she left, she made $21.6 million giving speeches to Wall Street banks and other special interests and in less than two years, secret speeches that she does not want to reveal under any circumstances to the public. I wonder why? Together, she and Bill made $153 million giving speeches to lobbyists, CEOs and foreign governments in the years since 2001. They totally own her and that will never ever change, including if she ever became president, God help us. CNN confirmed the $153 million in speaking fees in February 2016. As to Hillary's refusal to release transcripts of her Goldman Sachs, that has been addressed at length by publications such as Mother Jones, Washington Post, and Huffington Post, (Liberal leaning publications) along with a long list of conservative publications. 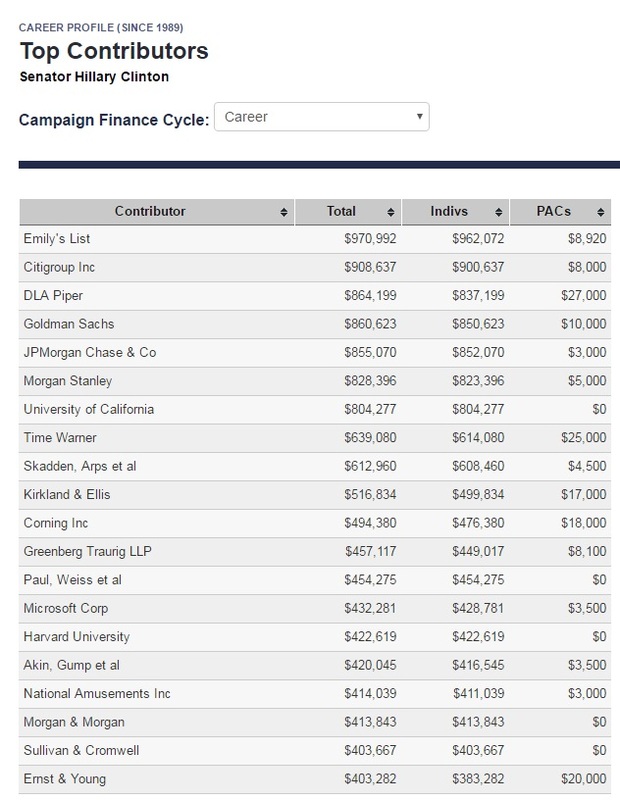 As to the special interests reference Trump made, a look at April reports regarding "Firms that paid for Clinton speeches have US gov't interests," along with Clinton's career donor list, pretty much makes the case that Clinton has, indeed, sold out to special interest groups. While liberal fact check sites attempt to discredit Trump's assertion about Hillary's time in the State Department, what many are ignoring are reports showing that "Clinton Foundation Donors Got Weapons Deals From Hillary Clinton's State Department," and how a "Disgraced Clinton Donor Got $13M In State Dept Grants Under Hillary." Just search Hillary Clinton State Department corruption on any search engine (before they censor the findings!) in order to get an idea of exactly how deep her corruption went. TRUMP - I have decided (ph) and visited cities and towns across America, all across America, and seen the devastation caused by the trade policies of Bill and Hillary Clinton, and it’s total devastation, all over New York, all over Pennsylvania, all over New England, all over the country. Hillary Clinton supported Bill Clinton’s disastrous and totally disastrous NAFTA. Just like she supported China’s entrance into the World Trade Organization. We’ve lost nearly one-third of our manufacturing jobs since these two Hillary-backed agreements were signed, among the worst we’ve ever done, among the most destructive agreements we’ve ever signed. Clinton did indeed support Bill's NAFTA agreement, specific quotes have been provided by Politifact on Clinton's changing positions, as well as highlighted in other places. Hillary also did support China's entrance into the World Trade Organization and is quoted as once stating "But on balance, I've looked at this, I've studied it, I think it is in the interests of America and American workers that we provide the option for China to go into the WTO (World Trade Organization). Right now, we are trading with China. We have a huge trade deficit with China. The agreement that has been negotiated between our two countries would open their markets to us in a way that they are not yet open, and in fact, for many large manufactured products, like automobiles, we would have the first chance to really get in and compete in that marketplace." TRUMP - This is the latest Clinton cover-up and it doesn’t change anything. If she is elected president, she will adopt the Trans- Pacific Partnership and we will lose millions of jobs and our economic independence for good. She’ll do this, and just as she has betrayed the American worker on trade at every single stage of her career, and it will be even worse than the Clinton’s NAFTA deal, and I never thought it could get worse than that. While Clinton now denies her support for the TPP, and has actually claimed she once said she "hoped" it would be the gold-standard, Politifact points out that her claims now, do not match her previous assertions. Clinton’s phrasing -- that she said she "hoped it would be the gold standard" -- implies that she was undecided on the TPP. But that doesn’t exactly match up to her prior comments. We found that her previous remarks actually gave the impression that she had confidence in the deal as it stood. In Australia in 2012, Clinton delivered remarks on the general topic of the U.S.-Australia relationship. Here’s everything she said about the TPP in that address, with the "gold standard" comment in bold. "So it's fair to say that our economies are entwined, and we need to keep upping our game both bilaterally and with partners across the region through agreements like the Trans-Pacific Partnership or TPP. Australia is a critical partner. This TPP sets the gold standard in trade agreements to open free, transparent, fair trade, the kind of environment that has the rule of law and a level playing field. And when negotiated, this agreement will cover 40 percent of the world's total trade and build in strong protections for workers and the environment. It seems multiple publications also agree with Trump as to how damaging the TPP is to America, as seen by Economic Policy Institute, Alliance for American Manufacturing, and Truth Out Org, the latter stating "Instead, the economists noted, the 12-nation Pacific Rim trade deal will likely lead to the loss of 448,000 jobs from the US workforce, while lowering GDP by more than a half-percentage point over the next decade. The report also estimates that TPP will cause labor's share of income to decline by 1.3 percent, increasing inequality in the United States." Other topics Trump highlighted were Benghazi, the rise of ISIS under her watch at the State Department, Clinton's support for bringing more Syrian refugees into America, Hillary's vow to embrace more illegals into the U.S. and provide amnesty, and her pledge to make immigration reform a priority in her first 100 days, among other things you can hear below in Trump's home run anti-Hillary speech that critics and supporters alike are praising. 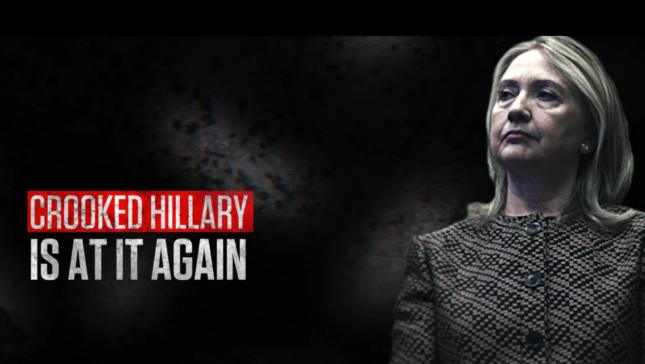 BONUS VIDEO - NEARLY 9 MILLION VIEWS - Hillary Clinton lying for 13 minutes straight.